With thanks to Dr Kat Smith, paediatric registrar and education fellow at King’s College Hospital…. The somewhat red, somewhat swollen eye is a relatively common presentation in children, and distinguishing between peri-orbital and orbital cellulitis hinges closely on an examination which can be difficult to perform in young children who cannot communicate pain on eye movement or subtle changes in vision. The orbital septum is key in differentiating between peri-orbital and orbital cellulitis, and in dictating management. 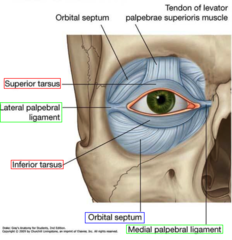 For those of us who haven’t thought about it since medical school, it is an extension of the periosteum of the frontal plate of the upper eyelid; a tough structure, where infection cannot pass from front to back unless the septum is breached by a sharp object. However, the orbital septum is not as thick and well developed in infants as it is in older children and adults, and so is not as effective a physical barrier in this age group. Peri-orbital (or pre-septal) cellulitis is inflammation and infection of the eyelid soft tissue superficial and anterior to the orbital septum; the septum itself is not affected. Ocular function remains intact. Orbital (or post-septal) cellulitis is infection of muscles and fat within the orbit, posterior to the orbital septum; the septum itself can be affected. It’s location in muscles and fat leads to associated ocular dysfunction. Children are twice as likely to develop periorbital and orbital cellulitis in comparison to adults, and whilst in adults peri-orbital cellulitis is usually secondary to a superficial injury, children may develop it secondary to an occult underlying bacterial sinusitis (in particular, through the thin and porous ethmoid bone; there is often a history of recent URTI) or due to spread from another primary infection, such as pneumonia. This difference in underlying aetiology means that in children a peri-orbital infection can rapidly progress to the much more concerning condition of orbital cellulitis, with the associated risk of rare but serious complications such as abscess formation, cavernous sinus thrombosis, intracranial abscess, and loss of vision. Most children will be well, with mild-moderate swelling and erythema and no red flags; these children can initially be managed in the community, and most will not require later referral to secondary care. Children with mild-moderate eyelid swelling, no significant erythema and an obvious cause – such as a chalazion or insect bite – do not have peri-orbital cellulitis, although they may need advice or treatment for the underlying cause such as warm compresses or anti-histamines. Those with mild to moderate swelling, erythema and no obvious cause but no red flags are likely to have peri-orbital cellulitis and so require oral antibiotics; typically a 5-7 day course of co-amoxiclav is given, although this varies dependent on local microbiology guidance. Because of the underlying aetiology of peri-orbital cellulitis in children, parents should be advised that if children develop any red flag symptoms they require immediate medical review, and a GP review should be arranged for 48 hours’ time to ensure that symptoms have started to improve. It can be unclear in young children if they have any red flags; if in doubt, refer to secondary care for review by ophthalmology, A&E, or paediatric teams. Even in secondary care it can be unclear, and children may be admitted simply for oral antibiotics and observation. ENT teams will also need to be involved if orbital cellulitis is suspected. As above, children with any red flags are likely to have orbital cellulitis and will likely require admission to hospital for blood tests, cultures and IV antibiotics +/- imaging of the sinuses and orbits (although more extensive neuroimaging is indicated if there is a suspicion of cerebral infection). Robinson A, Beech T, McDermott A, et al. Investigation and Management of adult periorbital or orbital cellulitis. J Laryngol Oto. 2007;121:545-7. Bell’s palsy – time for a rethink re steroids for children? Bell’s palsy is an idiopathic facial nerve palsy first described by Sir Charles Bell in 1830. It typically presents with a sudden onset of unilateral facial palsy. It presents as a unilateral lower motor neurone weakness ie. the forehead is also involved (if the forehead is not involved, this is an upper motor neurone weakness with a different aetiology and needs prompt referral for further investigation). The prognosis in true Bell’s is typically good with up to 90% of children recovering by 3 months of age1. The mainstay of management in children is supportive (artificial tears/patching). The convention – at least in adults – is for the early (within 72 hours of onset) use of oral prednisolone at a dose of 2mg/kg (max 60-80mg) for 5 days followed by a 5 day tapering dose2. The evidence base for this comes from large randomised controlled studies in adults3,4. Two large double blind randomised control studies looking at over 1300 patients demonstrated that early use of Prednisolone orally significantly improved symptoms at 3 months (p<0.001) with a NNT of around 53,4. There are no similar studies in children and it is worth considering that children typically have a better prognosis than adults. Whilst prednisolone orally would be appropriate and safe for most children there may be instances where the risks of oral steroids could be considered too great to justify their use i.e. in a poorly controlled diabetic patient (which is a group in whom Bell’s palsy is more prevalent). In the last decade there has been an ongoing debate around the use of oral antiviral agents such as Aciclovir in the management of Bell’s Palsy. It is widely believed that Bell’s Palsy is due to an underlying Herpes Simplex infection and PCR studies have demonstrated concurrent HSV infection at the facial nerve in adult patients with Bell’s Palsy5. Despite this, good quality, large scale studies looking at the efficacy of oral antiviral agents have failed to demonstrate a benefit3,4. The current evidence base for the medical management of Bell’s palsy comes predominantly from adult data3,4. Children typically have a milder illness with a quicker recovery than adults irrespective of the treatment chosen1. UpToDate would have us believe that the mainstay of medical management is the use of oral steroids at a dose of 2mg/kg(max 60-80mg) for 5 days followed by a 5 day taper. Additional antiviral treatment appears to be unnecessary with large-scale, high quality studies not showing a benefit. Smaller, lower quality studies have suggested additional antivirals may be useful and these could be considered on a case by case basis6,7. For example in a severe case (complete paralysis) with clinical evidence of concurrent Herpes Simplex infection it may be worth considering additional antiviral medication such as oral Aciclovir. Peitersen E. Bell’s palsy: the spontaneous course of 2,500 peripheral facial nerve palsies of different etiologies. ActaOtolaryngol Suppl. 2002. Sullivan FM, Swan IR, Donnan PT et al. Early treatment with prednisolone or acyclovir in Bell’s palsy. N Engl J Med. 2007;357(16):1598. Yeo SG, Lee YC, Park DC, Cha CI. Acyclovir and steroid versus steroid alone in the treatment of Bell’s palsy. Am J. Otolaryngol 2008;29:163–168. Schirm J, Mulkens PS. Bell’s palsy and herpes simplex virus. APMIS. 1997;105(11):815. Minnerop M, Herbst M, Fimmers R, Kaabar P et al. Bell’s palsy: combined treatment of famciclovir and prednisone is superior to prednisone alone. Neurol. 2008 Nov;255(11):1726-30. Lee HY, Byun JY, Park MS, Yeo SG.Steroid-antiviral treatment improves the recovery rate in patients with severe Bell’s palsy.Am J Med. 2013 Apr;126(4):336-41. June’s PDF digest is ready for consumption. Both APLS and NICE have lost paraldehyde from their status epilepticus algorithms, a link to Working Together and an article on sticky eyes v. conjunctivitis. Blood pressure centile charts and a plug for the London Deanery’s communication skills courses. Do leave comments below. Torticollis can be congenital or acquired, but this article will focus mostly on the congenital form, affecting 0.3% of infants and usually presenting in the first 6 months of life . It is the third most common reason for referral to orthopaedics in this age group. The overwhelming majority of cases seen are due to a benign muscular problem, but some more sinister diagnoses can also present in a similar way, so it is crucial to be aware of these. 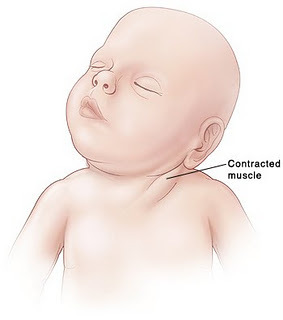 Most cases of congenital torticollis are the result of damage to the sternocleidomastoid muscle (SCM) at birth (for example in instrumental delivery) or in the uterus (restricted movement or abnormal positioning causing muscle damage). Damage to the SCM causes it to shorten or contract as fibrosis affects the area. Fibrotic change in the damaged muscle is felt as a hard lump – the ‘pseudotumour’ of torticollis, as it is sometimes called. This shortening of the muscle in turn makes it difficult for the infant to turn their head, resulting in neck stiffness and a fixed head position, with very limited neck movement. Male infants were also found to be 1.9 x more likely to have positional deformities including torticollis. With these presenting symptoms described above and nothing else of note, torticollis is clearly the first diagnosis that springs to mind. HOWEVER – to play the devil’s advocate – a baby who presents with ‘a lump in the neck’ and ‘abnormal neurology’ certainly demands a careful history and examination. The SCM is supplied by the accessory nerve (CN XI), which exits the skull through the jugular foramen. Anything affecting the structure of the upper cervical spine or skull base could compress the nerve root of CN XI and cause torticollis. ‘Ocular torticollis’ occurs when there is 4th cranial nerve palsy. The superior oblique muscle, supplied by CN IV, causes the eye to look inwards and downwards. Paralysis of the muscle means the eye cannot adduct or internally rotate, and this causes torsional diplopia, which the child ‘corrects’ by tilting the head position. Adopting this position over a long period of time eventually causes contracture of the SCM. This condition can be ruled out by using the cover test (watch a 7 minute long Youtube video with a rather disconcerting picture of a huge eye in the background here). When the affected eye is covered, the child should spontaneously correct their head position (in the early stages, before muscle contracture has occurred). Appearance (see image): The head is tilted to one side (to the side of the affected muscle), and the chin is turned to the other side. There is stiffness, from the lack of movement, so there may be pain when the neck position is passively corrected. A lump may be felt in the distal SCM. The key is to differentiate between muscular torticollis (ie common, benign, easily correctible) and non-muscular torticollis (ie possibly secondary to neurological, ocular or vertebral pathology, and needing further investigation. If there is a lump palpable in the SCM, it needs to be differentiated from other causes of a lump in the neck. Ultrasound is the best first line investigation – it detects fibrosis of the muscle (diagnosing torticollis) but would also pick up abnormal lymph nodes or masses. Fine needle aspiration would be the next step if there was any uncertainty of the diagnosis, but this is rarely needed. Neck stretches, performed regularly, moving the neck in the opposite direction to the affected muscle (tilt head sideways towards non-affected side, rotate towards affected side). Physio referral is indicated so parents can be taught the correct way to perform the stretches. Physiotherapist may advise use of a neck brace in certain cases. A recent successful non-surgical development in treating cases resistant to physio is using botox injection. The evidence for chiropractic treatment is weak, isolated successful cases have been described,  but there has been no randomised controlled trial. There are also reports of infants with torticollis caused by neurogenic tumours being treated (unsuccessfully) by a chiropractor before the correct diagnosis was made,  so it is imperative that parents have consulted a doctor before they choose to seek chiropractic help. I thought it might be useful to outline the sort of paediatric surgery Whipps offers. This post is being put together with the help of my surgical colleagues who are keen to continue receiving appropriate paediatric referrals from GPs. I will be updating it as and when I get the information from the different specialties. A word from the anaesthetists: As a general rule all of our consultants on the on-call rota are currently able to anaesthetise any child, 3 years or above presenting as an emergency as long as they are ASA 1 or 2 and needing non body cavity surgery (appendicectomy excepted) with an expected duration of less than 2 hours. (“ASA 1 and 2” are children who are previously fit and well and those with a mild underlying systemic illness such as mild asthma.) We have three consultants who have had advanced training in paediatric anaesthesia (Drs. Williams, Singh and Radhakrishnan) who undertake regular elective paediatric lists who are happy to anaesthetise younger children. Please refer such things as in-grown toenails and verrucae to podiatrists rather than surgeons. Mr Kenyon 1 per month at WX. N.B. We are in the process of setting up a Paediatric ENT Specialist Community Clinic (SCC) in conjunction with Dr Watkin and our audiological colleagues at Wood Street Clinic – watch this space! Strabismus, eyelid, lacrimal, cataract (with infants being referred to Great Ormond Street where our ophthalmologist with a paediatric interest also works). GP February 2011 reminds us all of the NICE guideline on Attention Deficit and Hyperactivity Disorder. We continue our 6-8 week baby check series with information on the absent red reflex and go back to our “from the literature” box to discuss snoring and obstructive sleep apnoea (OSA). We have relaunched our prolonged jaundice guideline. Please leave comments and questions below. Early detection of potentially sight and life-threatening eye disease. Due to the early and time-limited plasticity and development of the eye, any blockage of light to the retina interferes with development of optic neural pathways and can have profound effects on later vision. For the child that won’t open his/her eyes: try picking/sitting them up or rocking them from sitting to lying. Having a parent hold them on their shoulder (as if winding them) and looking from behind often works. A feeding child will often open his/her eyes, although breast feeding then makes looking in the eyes logistically tricky. Children with darker skin tones may have pale retina. If retinal vessels can be seen and followed to the disc and the reflex is equal bilaterally then this is reassuring. Comparison with parents’ red reflexes may also help. Family history of neonatal eye disease e.g. retinoblastoma, congenital cataracts: Routine referral to paediatric ophthalmologists. Low birth-weight/premature infants (at high risk of retinopathy of prematurity): Should have had ROP screening and follow-up arranged as necessary by neonatal unit. 1. Robertson’s Textbook of Neonatology. Fourth Edition. 2005. Edited by Janet M. Rennie. 6. http://www.bartsandthelondon.nhs.uk/docs/poster_red_reflex_print.pdf Poster of red reflexes and referral pathway from Bart’s and The London.